While we're forever envious the French get to enjoy cheese and bread at every meal (while seemingly maintaining their slim figures), we're also in awe of their forward-thinking beauty and decadent desserts. Now an exciting innovation exists that combines both (beauty and macarons that is, not bread and cheese unfortunately). Meet the Le Mini Macaron Gel Manicure Kit, the thirty-second mani gadget that looks good enough to eat. French women are always properly preened and well turned out, whether that be their effortless fashion or flawless, natural make up. You could never imagine them ever missing their nail appointment either, after all it's called a French manicure for a reason. 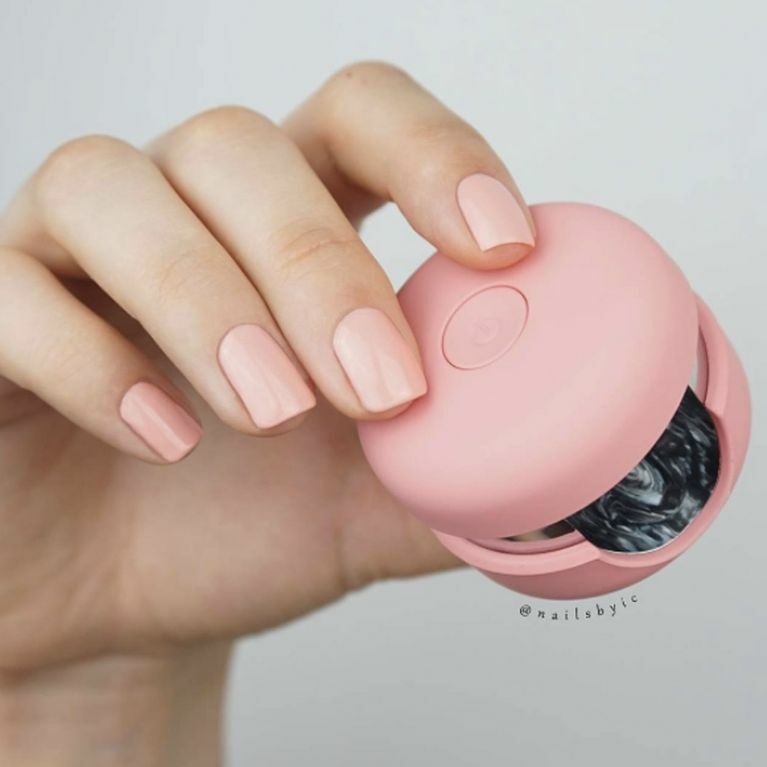 But if you're the type to sack off that salon visit to stay in and catch up on The Walking Dead instead, now you too need never have to leave the house with chipped polish again, thanks to this adorable invention that gives you an Insta-worth gel manicure in just one click. If you've ever tried your hand at DIY gel mani before, you'll be familiar with the pros and cons; traditionally at-home kits are time consuming and fiddly, what with the base coat, top coat, primer, curing solution, and chunky lamp to finish it all off. It was this that provided the inspiration behind the 'Le Mini Macaron' which cuts the time and kit, giving you a shiny gel polish in just one step. Funded through a Kickstarter campaign, the mini macaron gives you your French fix from the comfort of your bedroom - and it's completely guilt and sugar free. But its adorable appearance isn't the best part - the gel polish application is a one-step process, so you're saved the priming, setting and buffing efforts. Simply brush on the colour as you would normal polish, then cure the colour under the LED macaron lamp for thirty seconds one finger at a time with a single click. It's small enough to fit in your handbag so you can touch up while jet-setting, too. Each kit contains a bite-sized lamp, charger, gel polish, cuticle stick, nail file and 10 remover pads, and is retailing for $35 which (at time of writing) is £26.83 - a bargain when you each salon appointment sets you back £20 easily. Buy yours here.